Last week I was in Kiev, Ukraine for IBM business. What a beautiful city it is! For those of you who don't know, Kiev used to be the capital of the ancient Russia (Kievskaya Rus'). While being there I enjoyed excellent Ukranian food, including "salo" - something I ate extensively in my childhood since I am half Ukranian myself. Kiev is a great tourist destination as food and other services is relatively inexpensive and there is a lot to see in the city. US citizens and Russians do not need a visa to visit Ukraine. On the day of departure I got a chance to tour perhaps the oldest monastery on the territory of Ukraine and Russia - Kievskaya Lavra, founded in 1051 - almost 1,000 years ago. 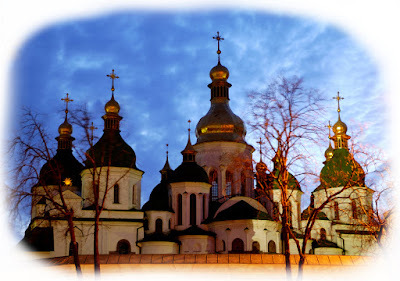 Lavra is one of the seven wonders of Ukraine and is quite amazing. The most important part of Lavra is not even its buildings, but caves with burials of dozens of saint monks, including some very famous people, such as Nestor (the first historian in Russia) and Ilya Murometz (the legendary / mythical warrior who could alone win the battle against enemy army). Monks lived underground in caves and some even buried themselves in cells for many years with a small window left open for food. Listening to those stories makes me shiver.